Handspun in Nepal from the snipped ends of saris, this wonderful silk yarn is popping up all over in shops and on the web. 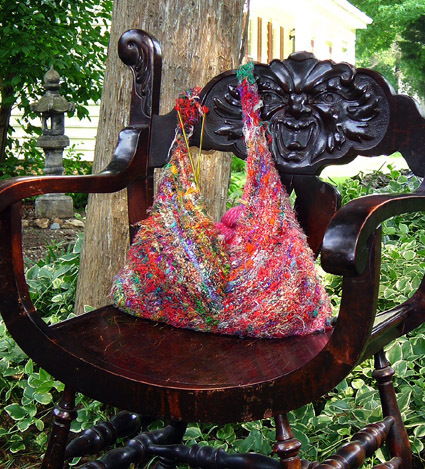 Generally sold by the ounce, every skein varies greatly in its colorway, gauge, twist and texture; and this bag is designed to capture the character and charm of each unique skein. The yarn starts out dirty and musty, but handles washing well. Once finished this bag has a lovely sheen, nice drape and wears like iron. The scrappy nature of this yarn makes fancy stitch work out of the question. So, the sideways knitting of this pattern keeps it interesting. It’s great for beginners and mindless knitting. Finishing is very simple; no neat little stitches necessary! Rolling this yarn into a tight ball by hand will help keep it from tangling and make it more manageable. 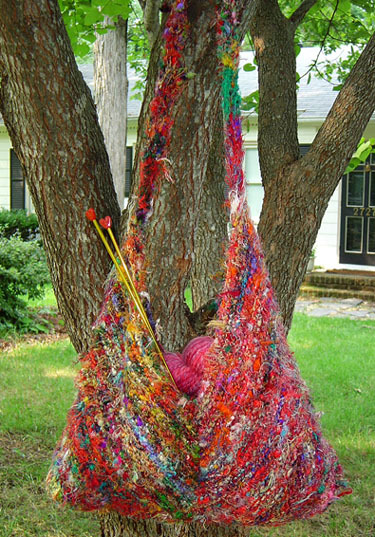 It will twist back on itself occasionally as you knit; pull and tug as necessary. CO 3 sts. K 1 row. *Row 1(RS): Knit in front and back of first stitch, knit to last stitch, knit in front and back of last stitch. Use small safety pin to mark this as the right side. Repeat from * until triangle measures 7.5; inches on the along each side edge. **Row 3 (RS): K2tog, knit to last stitch, knit in front and back of last stitch. Repeat from ** until longest side measures 12.5. Next row (RS): BO all but last 5 sts. Transfer these sts to a stitch holder. Remove safety pin. Now examine your pieces and decide which which pieces look most appealing together. The short side of each piece (formed by the decreases) goes in the center of each side of the bag (see photo). Once you have your pieces paired, sew the center seam of each side of the bag. Feel free to use your favorite method for stitching; the yarn is already so scrappy that no stitches – neat or messy—will show. Use a stitch that will allow the pieces to lay flat and be sure that the top and bottom match up— pull and tug as necessary. After you have assembled the front and back stack the pieces with your choses right sides facing. Stitch up the sides and bottom. Pull your stitches tight and keep them close together. Remove both stitch holders from one side of the bag and place all 10 sts on a needle. *Row 1: K2tog, k2, knit in front and back of fifth stitch, knit in front and back of sixth stitch, k2, k2tog. Repeat from * until strap measures 11 inches long, or half of total desired strap length. The strap will stretch with use, so make it a little shorter than you would like it to end up. Knit several rows straight, then place all sts on a safety pin or stitch holder. When strap halves are desired length, graft or stitch the two ends together. Use very sturdy, tight stitches. Weave in all ends, or tie and leave as is for an extra scrappy look. Hand wash in cold water, or machine wash on delicate cycle. Roll in a towel to remove excess moisture. Shape bag and leave flat to dry. The bag will shed a little once finished; you can air fluff it in the dryer after it is dry to speed up the process. 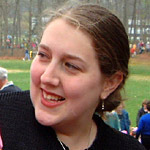 Stephanie is an at-home mom living in Richmond, Virginia, with her husband and her favorite project: 3-year-old, Adaylia. She enjoys knitting, spinning, sewing and all fiber related ventures. You can visit her website at www.woolpeddler.com.